It is best to choose the mode of transport according to the type of holiday you have planned. Needs are somewhat different when you travel alone or with family, when you have very little time or a lot of time, when you want to stick to your itinerary or you want to explore and be free to organize your schedule. We present an overview of the available modes of transport in Croatia so that you can easily compare their advantages and disadvantages and choose the one that suits you best. Air transportation is recommended if you travel alone or with someone, if you don't have a lot of time or if you have a non-flexible pre-planned itinerary. If you're coming to Croatia on a plane, you will most probably land at one of the seven international airports: Zagreb, Osijek, Rijeka, Pula, Zadar, Split or Dubrovnik. Independently or in cooperation with partners, the national company Croatia Airlines connects Croatia with the rest of the world. During the tourist season, the number of international flights goes up, and low budget operators connect many international centers with the most popular Adriatic destinations. Once you land on an airport, you can rent a car to get to the city center, take a taxi or a shuttle bus, or choose public transport. Most usually, you'll find direct connections to the city's main bus station so you can get to your next destination very quickly. Even though public transport is the most affordable option, the most practical one is the shuttle bus since its departures correspond to the landing times. Flying inside the Croatian borders is most usually a choice if you need to get from Dubrovnik or Split to Zagreb in no time. Croatia has a specific shape so the distance between Dubrovnik in the far south and Zagreb in the north amounts to 600 km. That is why taking a flight from Dubrovnik to Zagreb can save you quite a lot of time. If you book your flight well in advance, you can get more affordable prices – for both national and international flights. Note that the islands of Lošinj, Krk and Brač also have airports. More information on Croatian airports can be found here. 1. Buy your ticket in advance to get the best price. 2. Smart packing. Pay attention to hand luggage restrictions so that you keep all of your belongings and don't have to pay additional luggage fees. 3. Plan options, timetables and transfer prices in advance so that you can have a stress-free landing. 4. Don't forget to pick up your luggage, and in case it gets lost, start dealing with the situation right away. 5. If the flight is long, try to take a nap to get to your destination fresh, relaxed and ready for the day ahead of you. Railway traffic is recommended for groups, those who have a lot of time and their travels aren't necessarily planned to the last detail, and those not willing to spend precious holiday hours stuck in summer road traffic jams. Even though the railway system is spread out quite nicely and connects distant locations, railway traffic is slow – most often two times slower than bus traffic – because of the infrastructure, in the first place. Still, railway traffic is reliable: most trains are on time, clean and tidy. International connections include Austria, Germany, Hungary and Slovenia. The advantage is the possibility of a quality rest during travels, as well as the possibility to transport a lot of luggage, including bikes, and making stops in smaller, less known places. It is exactly those places that are ideal for big adventures and getting to know different aspects of Croatia, like Lika, Dalmatian highlands, etc. Even though you can buy a ticket from train personnel, we recommend buying the ticket at the train station to make sure there are no questionable situations later. Tickets can also be purchased online. 1. Purchase the ticket at the stand or online and check if you can get any discounts. 2. Find a coupe just for you or join someone. 3. Use the night train ride to sleep so that you arrive fresh to your destination. 4. Bring something to eat and drink because food and beverages are unavailable on national trains. 5. A return ticket is more affordable than a one-way ticket. Choose a bus if you don't want additional stress caused by car rides, and if you want to relax and destress while on the road. If you're traveling alone or with someone, it's easier to enjoy your time together during transport between locations A and B. The bus system in Croatia is currently one of the most developed transportation options and it is very often the first choice for intracity and intercity transportation. Buses depart almost every minute in national and international directions, and tickets are available at very affordable prices. Croatian bus stations are mainly located in the city centers and very accessible, and most buses offer free WiFi and other benefits. When it comes to national traffic, buses are the most cost-efficient option because they are affordable, quick and reliable. For example, a trip from Zagreb to Split on highway A1 takes 5 hours including a 20 minute break. There are connections to all parts of Croatia and a very big number of passengers recognize this so it can get a bit hectic, especially during holidays and during summer. In those periods, we recommend booking tickets in advance. You can do that only from your departure station, but some bus companies offer online ticket purchase, regardless of the station. Getting around by bus is only complicated on the islands because the buses are less frequent. Bigger towns and cities have daily and night schedules so you can plan your activities care-freely. Timetables and information about each bus station can be found on their websites, and here are only some of them. 1. Buy the ticket at the ticket office, online or book it over the phone so that you get your seat on time. 2. Check if any discount applies to you and buy a return ticket if possible to save even more money. 3. If possible, travel during the night or early morning in the summer so that you can spend your day on the beach instead. 4. Dress in layers because the AC might not be en sync with your ideal temperature preferences. 5. Bring some food and drink and do try to get some rest. If you're coming to Croatia from Poland, be sure to choose GlobTourist. Extremely comfortable and modern high-quality buses are a guarantee of a safe arrival to your dream destination. Traveling by car is a good option if you're traveling with your family, friends, pets or just want to have complete control over every mile and every minute of your holiday. Also, it's good if you're up for random adventures along the way. If you appreciate freedom, like to design your own schedule and have everything under control, then taking the car is the option for you. 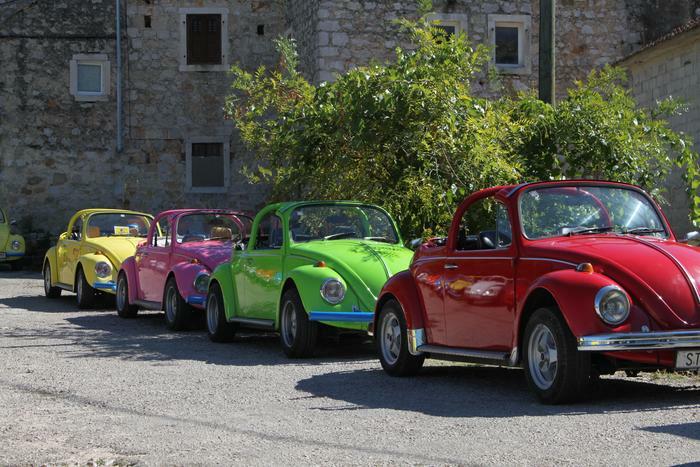 To drive a personal car in Croatia you need a valid driver's license, vehicle license and a proof of car insurance. In case you're arriving by some other type of transportation and are planning on renting a car, it's good to have the international driver's license and credit card for down payment. If you're coming to Croatia in your own car or you're renting one, you have great roads ahead of you – highways (with fees) and state roads (free). The signs are clear and ambiguous, and the roads are mapped. Getting around is, therefore, simple and easy – especially if you're getting around with the help of a navigation system. Taxis can be found in bigger cities. The prices differ from one company to another and there are often applications you can download to get a taxi. It will take you roughly 4 hours to get to Split from Zagreb on A1, and the total distance is 409 km. In the meantime, you might wish to take a break or get off the highway before you've reached your destination. In that case, we recommend beautiful Skradin as an exceptional pace to rest and take a break in complete peace provided by the river Krka on the one side and the Adriatic sea on the other. After your Skradin break, take the D8 to Split and enjoy the amazing scenery which will be your companion till the end of your trip. Note that such trip will take longer than the aforementioned 4 hours, but it's completely worth it! Summer traffic jams are usual and expected, especially during weekends and public holidays. The reports on roads in several European languages can be listened to on the Second program of the Croatian radio (98,35 MHz) every couple of hours. 1. Travel well rested, fresh and calm. If possible, split the route with your traveling partner. 2. If you're traveling with small children, bring toys and make sure they are entertained, and ensure good sleeping conditions so that the ride is comfortable for everyone. 3. If traveling with your pet, don't forget about your pet's needs and plan your stops accordingly. 3. Be prepared for longer waiting time on highway entrances and exits, just like city entrances and exits during summer. 4. If you travel on weekends, start your trip on Saturday evening or Sunday morning when temperatures are just right. 5. If you're not a fan of traffic jams, and you don't mind a slower drive on a two-lane road, choose the Adriatic state road D8 instead. Sea traffic is the best and the only option for those wanting to arrive to one of the Adriatic islands without having to row themselves. This type of transport is most often very relaxing and signifies the beginning of a great vacation. Besides air, railway and road traffic, Croatia has sea traffic dominated by ferries and catamarans that depart everyday from major Adriatic ports to beautiful islands and from island to island. There is also quite a big number of excursion boats, so make sure to do some research if you decide to go with that option. The Adriatic coast spreads across over 5000 km and includes more than 1000 islands, and sea traffic is organized very well on a national level. Ports of Split and Zadar are among the busiest harbors. Alongside national lines, Croatia is connected to Italy – namely, Ancona and Bari – with everyday departures. Ferries can transport everything from passengers and luggage to bikes and cars. Some of them sail during the whole year, and some only during tourist season. They mainly connect the shore and islands, but there are also lines connecting the islands themselves. It is important to check the timetables because departures off-season sometimes vary from the ones during season. If you plan on transporting your car, take summer jams into account because boarding the ferry can take up to a couple of hours. That's why we recommend arriving to the dock as early as possible. The national shipping company is Jadrolinija, and some private companies operate sea traffic as well. Catamaran tickets are usually sold on the day of the travel so we recommend timely arrival to harbor and purchasing a ticket on time. We also recommend checking the timetable and prices in advance so that there are no surprises when boarding. The tickets for Jadrolinija's ferries and catamarans can be purchased in harbors and online. Ferry tickets are valid for all departures on the chosen day, but do not guarantee boarding the ferry at the desired time. 1. Buy the ticket at the ticket office or online and check additional cargo fees in advance. 2. If you're traveling during night, dress in layers because it can get cold when you sit on a ferry at night. 3. If you're traveling during day and sitting on deck, put sunscreen and wear sunglasses and a cap to protect your skin from sunburns. 4. You can buy food/drinks on the ferry/catamaran so there's no stress if you forget to bring a bottle of water. 5. If you're transporting your car, get to the dock early enough so that you embark as soon as possible and avoid long waits in the sun.